Pastor Gene was born and raised in San Antonio, Texas. He attended Life Pacific College in Texas and received his B.A. degree in Theology with an emphasis in Pastoral Ministry. He met his wife, Bekki, while in college and they were married in 1990. 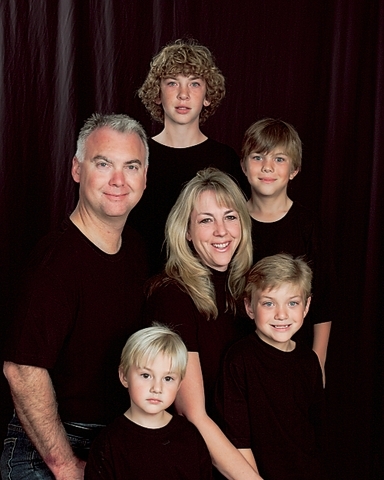 Gene and Bekki have 4 boys: Alex (High School), Nathaniel (Junior High), Elijah (Elementary) and Samuel (Elementary). Their rambunctious dog, Luke, completes the family. They have lived in Orange for 16 years. In 2000, Gene joined the staff at Covenant Community Church in Orange as assistant Pastor in charge of Family Ministry and Adult Discipleship. He continues to lead bible studies and assist with counseling as needed. Besides his love for the Lord and His people, Gene has a passion for a wide array of sports. He has coached his sons Little League baseball and basketball teams. One interesting fact about Gene, he once caddied in the Texas Open PGA Tournament. He is an avid golf fan as well as a very good golfer but rarely gets time to get out these days.